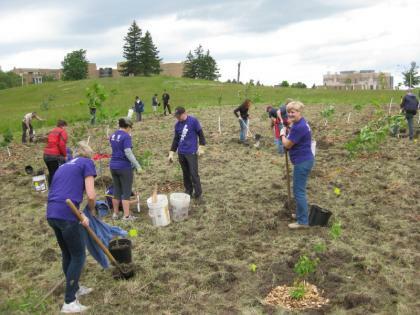 Purple T-shirts stood out as a team from Schulich Medicine & Dentistry planted dozens of trees for ReForest London in the Celebration Forest behind Parkwood Hospital on Sunday. Jennifer Devlin, Dinah Frank, Catherine Nabudere, Gillian Sneddon, Ann Sovan, Kathy Wallis and several of their family members participated. They enjoyed burgers and hotdogs after their hard work. The event was organized by the Teambuilding and Community Outreach Committee from the AO and Directors Joint Leadership Group. 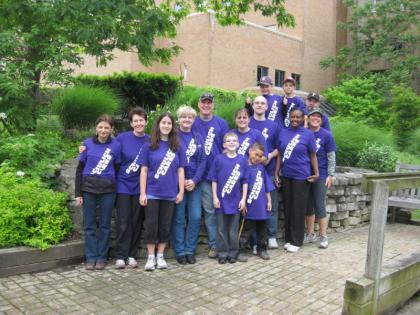 If you have members from Schulich participating in a community outreach or charitable event and would like team t-shirts which have "Schulich Cares" on the front and the Schulich and Western logos on the back, please contact Karen Dalglish at ext. 86227.